Unite members employed by Briggs Marine to run the Woolwich ferry in London have voted for strike action. The vote comes in response to proposals from the employer to cut jobs and pay with the introduction of new boats. The new vessels will use the latest technology and bring a ready excuse for the employers to make cuts. Where employers attempt to use automation and the latest technology to make cuts to pay and jobs, the response from the trade unions must be a militant one based on collective action. Unite members have voted both for strike action and action short of strike action. The intention is to issue notice to the employer for both types of action to run together. In response, the employers have asked for talks through conciliation service Acas. Unite has agreed to the talks. However, Unite is equally clear that the employers will not be allowed to use talks to cause a long delay before any strike action. Unless progress is made then notice will be issued for strike action. Unite regional officer Onay Kasab stated: "The response from members is superb. The union has launched a campaign which takes the position of all of our members into account - which in turn has led to a strike vote on the basis that we win for all of our members, not do a deal with winners and losers." 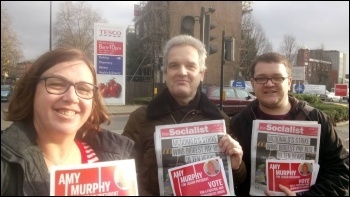 Ballot papers started hitting doorsteps on 15 January to vote for a new president of the shop workers' union Usdaw. Socialist Party members have been out campaigning for Amy Murphy to be elected, distributing some of the 11,300 leaflets sent out. Amy is running on a programme of changing the union into a more fighting, democratic one which campaigns for a £10 an hour minimum wage and supports members taking action against job losses and attacks on terms and conditions. There have been lots of support for these ideas and all agree the union needs change.